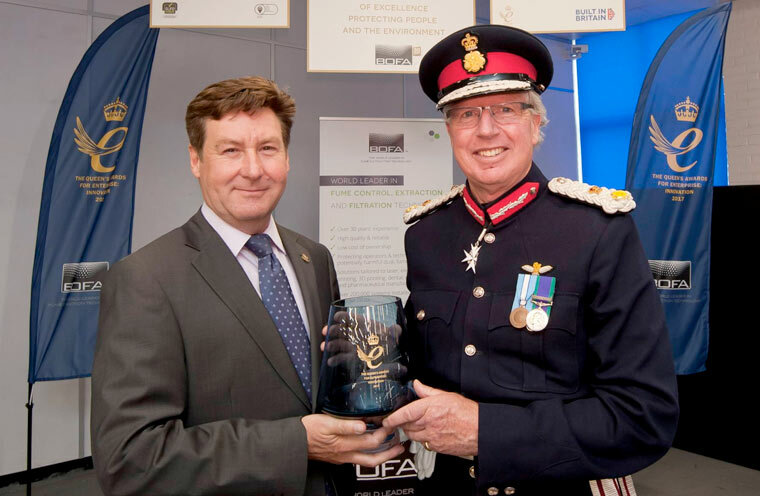 Her Majesty’s Lord-Lieutenant for Dorset, Mr Angus Campbell, has presented Poole-based BOFA International with the Queen’s Award for Innovation in recognition of their world-leading technology that is transforming the way companies remove harmful dust and fumes from the workplace. The prestigious accolade has been achieved by BOFA in its 30th anniversary year and acknowledges the success of its patented Intelligent Operating (iQ) platform, which enhances filtration system performance in industrial processes while simultaneously improving productivity. Tony Lockwood, managing director of BOFA, commented, “BOFA started as a small family business in a garage and has thrived over the last 30 years through a spirit of innovation. BOFA was launched in 1987 as a small family business and has since developed into a global technology leader, employing over 200 people at its Poole headquarters as well as having offices in the USA and Germany. The company continues to lead the way in the development of innovative dust and fume extraction systems that remove toxic and harmful airborne contaminants resulting from production processes in sectors as diverse as laser, electronics, mechanical engineering, printing, 3D printing, medical, pharmaceutical, dental and beauty. The Queen’s Award for Innovation is acknowledgment of the impact of the company’s revolutionary iQ platform, which has introduced performance enhancements, including independent filter status monitoring and remote data analysis, to improve dust and fume extraction efficiency, reduce the risk of production downtime and lower the lifetime cost of technology ownership. Says Tony Lockwood, “Our continuous investment in research and development has enabled us to grow a worldwide customer base, but we still retain the family values that were so important to the founders of the company. And, there’s more to come. BOFA will be bringing iQ2 to market, which will provide cloud-based system diagnostics and more extensive remote operational control – another world first.